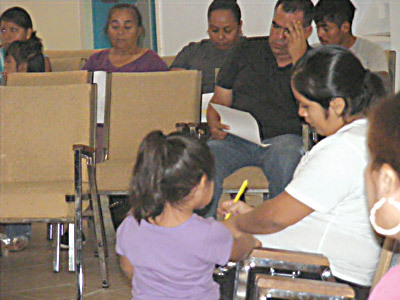 People taking the basic home banking class at Good Samaritan Mission concentrate hard on what is being taught. Penny Fletcher photos. The difference between Good Samaritan Mission in Balm and most other missions is that there is no handout without a hand-up. The Rev. Bill Cruz Jr. and his wife Theresa, who head the mission, changed its focus from handing out bags of food and clothing several years ago and have gradually worked into a whole new way of helping families in need through education, work ethic and the accomplished feeling of having earned what they take home. The mission also conducts men’s and women’s groups and a Kid’s Club, which are conveniently conducted after regular working hours. Most classes are 30 minutes long. After completion, each “student” receives a token for shopping in Tiendita, which means Little Store. The token may be exchanged for a bag of items the person selects such as food, toiletries, diapers and various clothing and household items. “This gives them a chance to choose, instead of being handed whatever someone else has put in a bag,” Cruz said. Good Samaritan’s mission statement is: “Through knowledge, we inspire the community to find healing; physically, emotionally, and spiritually, to transform the world for Christ.” It is implemented in everyday actions as well as in the religious services held there. Fran Fabbro, right, and translator Claudia Estrada. 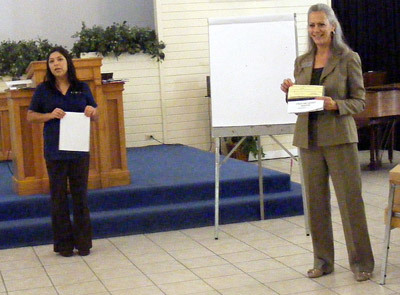 Oct. 8, Fran Fabbro, assistant manager at Cadence Bank in Sun City Center, gave a class in basic home banking with the help of translator Claudia Estrada, who participates in the token-earning program. So, unlike many at the mission, Estrada uses Spanish as her second language, not her first. “Translating is one way I can put in my community reinvestment hours and earn credit in the store,” she said. Both Fabbro and Estrada live in Wimauma and have many good things to say about education, and about the Mission. “I love to educate people about their money,” Fabbro said. A Valrico resident for 22 years before moving to Balm, she has been in banking 35 years, the last four at Cadence. At Good Samaritan Mission, Fabbro concentrated on check-writing, balancing checkbooks, and how to manage debits and credits. “I’ll be here three weeks, once a week on Tuesdays,” she said. The banking program is open to anyone who is in the “token” program at the mission. About 30 people attended the class the first week, with Cruz speaking in Spanish to the mostly Hispanic group. Then Fabbro gave her class in English, with Estrada’s help when translation was needed. Learning to speak English is considered an important component of learning at the Mission, but retaining the native cultures of those who attend is also central to their teaching. People choose their classes from a wide variety, including (but not limited to) cooking and nutrition; computer skills; emergency preparedness; literacy; and parenting. Gerado Assujo of Riverview has been in the area eight years. He attends classes at Good Samaritan Mission every week and exchanges his tokens in the food pantry. The token-exchange program for classes is called Seeds of Change, said office manager Jennifer Daly, who has been at the Mission for three years. People who wish to participate or volunteer may call the Mission Monday through Friday from 9 a.m. to 4 p.m. (closed for lunch from 12 to 12:30 p.m.); or check it out at 14920 Balm-Wimauma Road in Wimauma. The telephone number is 813-634-7136, and the mailing address is P.O. Box 213, Balm, FL 33503.